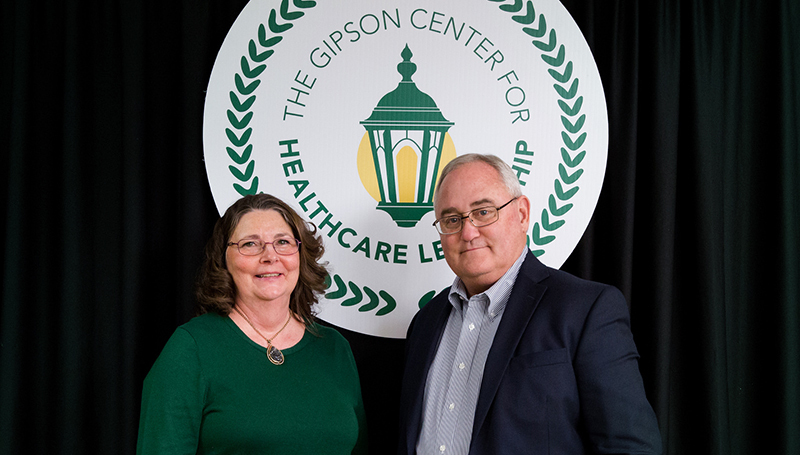 Emphasizing the importance of improving and transforming healthcare at both the regional and national levels, officials at Missouri Southern State University announced the establishment of the Gipson Center for Healthcare Leadership during a ribbon-cutting ceremony earlier this month. Located within the Julio S. León Health Sciences building, the center will help meet the growing demand for graduates with the education and skills to enter into healthcare business, management and leadership roles. The “backbone” of the center will be a new degree program – the Bachelor’s of Science in Healthcare Administration. “When people think of healthcare, they think of the clinical side,” said Dr. Richard Schooler, Dean of Missouri Southern’s School of Health Sciences. “But if you’re going to be a successful healthcare organization, you also have to be a high performing business organization. The curriculum for the 120-credit hour degree program will focus on areas specific to the health sciences, as well as business, management and communication. Students’ last semester will also include an internship within their field of interest. “What’s unique about this program is that it will be a mix of academia and real-life perspective,” Schooler said. Several area healthcare business professionals have already been tapped to serve as instructors. The center will be focused on more than just undergraduate education, however. “We’ll also provide certificate programs for people who are already in the workforce who wish to broaden their knowledge and skill set,” said Schooler. In addition, plans for the center include hosting a health service fair for high-school and middle-school students, as well as an annual healthcare leadership symposium. Schooler said a commitment has been made for the program to be certified by the Association of Universities with Programs in Healthcare Administration (AUPHA). It would join only 47 other programs in the U.S. to have that distinction. In making the announcement, university officials recognized the support of Bill and Tracy Gipson, who made a $1 million gift to help launch the center. “This proposal was a home run for us,” says Bill Gipson. “We both have a technical degree – Tracy’s is in dental hygiene and mine is in computer programming – and we both have business degrees. The initiative was also supported by a six-figure gift from Dr. Richard Schooler and his wife, Cheryl. Schooler said the process of hiring a director for the center is already underway, and work will begin soon to transform space in the Health Sciences Building into classrooms, faculty and staff offices, a conference room, and a student lounge and resource center. The new degree program will launch with Missouri Southern’s Fall 2019 catalog.